Tonight Eddie Gibbons read from his latest book What They Say About You at this New Words event. Starting his reading, Gibbons put down his glass saying it was only water, maybe that's because he is drunk on words! His poetic pint pot is brimming with wit and wordplay, bittersweet recollections of growing up in Liverpool, e.g. Words For Windows, where he told us ‘we didn't have neighbours, we had witnesses’, the ups and downs of being a poet, the prospect of getting older and growing short sighted in Death Shall Have No Dim Onion, fond memories of his father in Consolations and a tribute to Brian Patten, one of his heroes, in Notes From The Hurrying Man. These were just some of the poems he read in a reading which was jam packed with poetic delight. As Helen Nelson says on the blurb for What They Say About You, ‘An unmissable Eddiefest’. I couldn't say fairer than that. 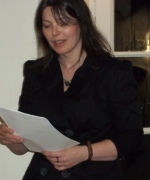 This evening, Catriona Yule read from her Koo Press chapbook Shedding Skin, as well as a couple of newer pieces, notably the bizarrely titled, If We Were A Hippopotamus. Yule's poetry goes for memories of days gone by, with Cloakroom, her brief depiction of hiding behind coats in the school cloakroom, bringing back a few memories from my own schooldays, and Seminary, describing how her mother made sponge cakes for seminarians. She writes well on relationships and makes the odd comment on society. Void was a real highlight for me, Yule's poem about a visit to Ground Zero where the only sound came from a flute player. 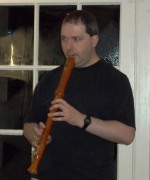 She was accompanied by Haworth Hodgkinson on soprano recorder playing Eastern-flavoured improvisions around her words. I found this really moving and the music gave an eerie feel to things. 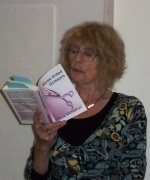 Olivia McMahon was reading from her second novel Rose Tinted Scissors, which she launched back in May. McMahon, an engaging storyteller, told us the story of Lucy, a young woman in the early 1960s. Not satisfied with the lot of being ‘someone's wife’ in Manchester, she moves to Paris to work as a hairdresser. The story follows Lucy's life, loves and dreams and was vividily evoked by McMahon's poetic prose; we were transported back in time to the early 60s for a few moments. 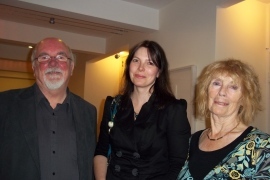 All in all, this was a highly enjoyable event from an inspired and inspiring trio of writers. Fit are ye haverin aboot?